Carl Spitzweg was born on 5th of February in 1808 in Unterpfaffenhofen, Bavaria. Although trained as a chemist, he discovered quite early his talent for drawing and his affinity with art. Spitzweg travelled extensively during his lifetime and the impressions formed by his travels greatly influenced his work. Shortly after completing his studies in pharmaceutics in 1832, he visited Italy. It was particularly in the cities of Florence, Rome, and Naples that he discovered the many significant works of Western culture which were to leave a permanent imprint on him. A severe case of dysentery in 1833 strengthened his resolve to abandon his career as a chemist and he proceeded to commit himself solely to his painting. 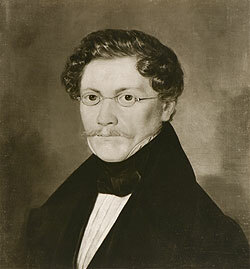 In June 1835, he became a member of the Munich Art Association and travelled that same year to southern Tirol with the landscape painter Eduard Schleich, the Elder. In 1839 he completed his first painting entitled ''The Poor Poet'. Although this recurring motif would later be considered his most well-known body of work, the painting was not accepted at this time by the jury of the Munich Art Association. As regards his graphic production, the first publication in 1844 of his own illustrations in the Munich weekly paper 'Fliegende Blätter' is considered quite significant. His visits to the Industrial Exposition in Paris and the World's Fair exhibition in London in 1851 were his first contact with the Oriental scenes which would begin to inform his work. To the deserving painter were bestowed numerous honours during the second half of Spitzweg's lifetime: in 1865 the Bavarian Royal Merit Order of St. Michael was conferred upon him, and in 1875 he was named an honorary member of the Academy of Fine Arts. Carl Spitzweg died on 23th of September in 1885 and was entombed in the historic South Cemetery in Munich. He leaves behind a body of work dedicated to the townspeople who inhibit his genre scenes, and with acute and pointed, but never ill-natured humour he portrays the everday bourgeois life of his time. Lit: Siegfried Wichmann, Carl Spitzweg. Verzeichnis der Werke, Gemälde und Aquarelle, Stuttgart: Belser, 2002. Old Masters, Newer Masters as well as works on paper tend to be framed; if works are not framed, this is stated specifically in the description. Frames are a complimentary bonus. For compelling technical design reasons the margins on certain illustrations may have been trimmed. Dimensions are indicated in cm and in the following order: height, width, depth. Dimensions for graphic sheets and printed artworks are referring to the plate size for gravure and the depiction size for flat screen printing techniques. Original drawings are specified by the sheet size. Works which have not been removed from the frame due to technical reasons are characterized by the additional comment cut-out of passepartout.